New ‘shuttle’ can cross the blood-brain barrier and transport substances into the brain. The brain is protected by a barrier of cells that tightly regulates the transport of substances into this organ in order to prevent infection. The essential protective function of this barrier is also a red light for 98% of drug candidates for the treatment of the central nervous system. Scientists at the Institute for Research in Biomedicine (IRB Barcelona) have presented a shuttle able to cross the blood-brain barrier and transport various substances into the brain. The team is now studying its application for specific medical conditions. Together with clinical researchers, they are preparing treatments for glioblastoma, the most aggressive brain cancer in adults, Friedreich’s Ataxia, a hereditary neurodegenerative disease, and a type of paediatric brain cancer. The study is published in the journal Angewandte Chemie. It is estimated that 20% of humans at some time will need a treatment that targets the brain and for many diseases there are some good candidate drugs but none have the capacity to reach their target and thus there is a subsequent loss of potential. The new ‘shuttle’ offers a solution to an urgent clinical need. The blood-brain barrier is not totally hermetic as the brain constantly requires oxygen, iron, insulin, etc. So there are transport mechanisms through ‘doors’ which open and close continuously. Taking advantage of the receptors through which the brain receives iron, the shuttle-ambulance crosses the barrier without disrupting nutrient flow or altering the protective function of the barrier. The team explain that they wanted a vehicle that exerted only this function, that of a vehicle, that was small (a peptide), and that has permanence in blood. The therapeutic value of the shuttle lies precisely in these two properties, which make it unique, namely its small size, comprising only 12 amino acids, and its permanence in blood from between 12 and 24 hours. Peptides have a half-life in blood of very few minutes. As the peptide is protease-resistant, its therapeutic development feasible, as nobody wants to take a medicine every 5 minutes; furthermore, this peptide could be produced on a large scale. If it were a large molecule, this would be economically complicated. In preliminary experiments with mice, the study also demonstrates the absence of an immune response and low toxicity. The researchers are already working on three projects for rare and orphan diseases. In collaboration with the Vall Hebrón Oncology Institute (VHIO), they are now focusing on binding a peptide to a therapeutic antibody to treat glioblastoma, the most aggressive brain cancer in adults. In collaboration with the Centro de Biología Molecular Severo Ochoa de Madrid, the researchers are studying an innovative treatment for Friedreich’s Ataxia, a rare hereditary neurodegenerative disease. The aim is to introduce into the shuttle a viral vector loaded with the gene that the cells of these patients lack, with a particular focus on targeting neurons. Recently, a team at the Hospital Sant Joan de Déu de Barcelona contacted the chemists at IRB Barcelona in order to adapt the shuttle to useful molecules for the treatment of a kind of paediatric brain cancer in which the barrier is intact. The team explain that each one of these projects requires the binding of a therapeutic cargo with very distinct characteristics. Everything that they learn will be useful for other diseases that require similar shuttles and for the development of analogue peptides to add to the portfolio of shuttles. The team have now patented the discovery to guarantee opportunities for its future development. Stating that many companies could recover promising molecules that were once discarded and attach them to the shuttles. This image shows the detail of one millimeter of a mouse brain. 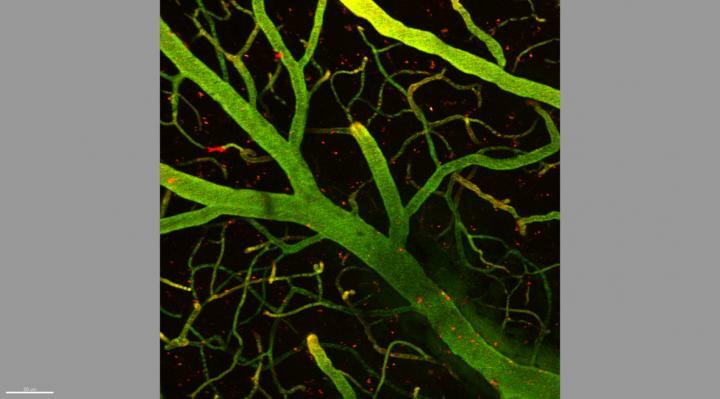 In green, capillaries that form part of the blood-brain barrier; in red, molecules attached to the shuttle patented by IRB Barcelona have managed to cross the barrier and reach the brain (black background). Credit: Benjamí Oller, IRB Barcelona.